Gilets Jaunes, Foulards Rouges, Polarisation in France as Violence continues. Police fired tear gas and water cannon to push back protesters at Place de la Bastille in Paris, one of the regular protest sites, as some demonstrators threw stones from a building site. The local prefecture reported 223 arrests in Paris. Interior ministry estimated at 2pm (1300 GMT) numbers for the 11th week of protests were at 22,000 across France, compared to 27,000 at the same time last Saturday. Amongst the police repression, and the violence of some of the Gilets Jaunes, activists behind the banners of the Nouveau Parti Anticapitaliste were attacked by a far-right squad. This Saturday, during Act XI of the Gilets Jaunes in Paris, the of the NPA was attacked twice by fifty individuals from extreme right. Organised and ultra-violent, the fascist groupuscule “the Zouaves” * (who claimed responsibility for the attacks) deliberately targeted our section of the march, wounding many of our comrades. On the origin of the term Zouve in the French colonial army see here. The NPA claim that the fascists were not “real” Gilets Jaunes. Yet they also say that the presence of the far right on the Gilets Jaunes marches is a “poison”. This is some real Gilets Jaunes at work. 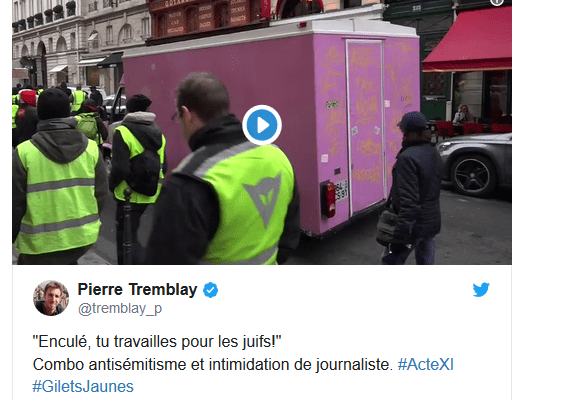 Un journaliste agressé à Paris par un gilet jaune : “Enculé, tu travailles pour les Juifs ! The incident took place near to the place de la Bastille. Nor is far-right involvement marginal. Amongst others, Victor Lenta, who has a long history of activism on the extreme right (former Parachutist, former member of the Bloc identitaire and Jeunesses nationalistes, who had participated in the Donbass militias to defend the Putin backed ‘People’s Republic of Donetsk’, and his friends, were part of the Service d’ordre’, stewards, for Paris. Divisions over the Gilets Jaunes list for the European Elections, revulsion at the racism, violence and anti-Semitism of some of the Gilets Jaunes, have grown. Now there is another challenge. Today will see a demonstration against the Gilets Jaunes. Pro-Emmanuel Macron or anti-gilets jaunes (yellow vests)? A march in response to the French gilets jaunes movement was held in Paris on Sunday. 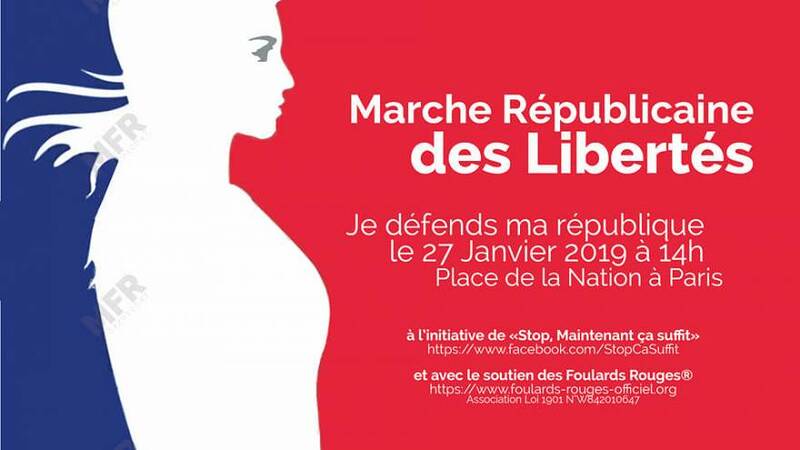 Dubbed the “Republican march for the liberties“, it brings together three groups that have since December voiced their opposition to the lasting social movement: the ‘foulards rouges‘, the ‘gilets bleus’ and the collective “Stop, maintenant ca suffit” (“Stop, that’s enough now”). « Morning Star Warns of “subterranean” communications between “elements” in Labour and “EU powers that be”. An NPA contingent attacked by 50 extreme right wingers and many were injured. Would not have happened to the Ligue Communiste in the 1970s! * Nostalgic purists can insert “comrade” here. Flop for Foulards Rouges demonstration as only 10,000 march.